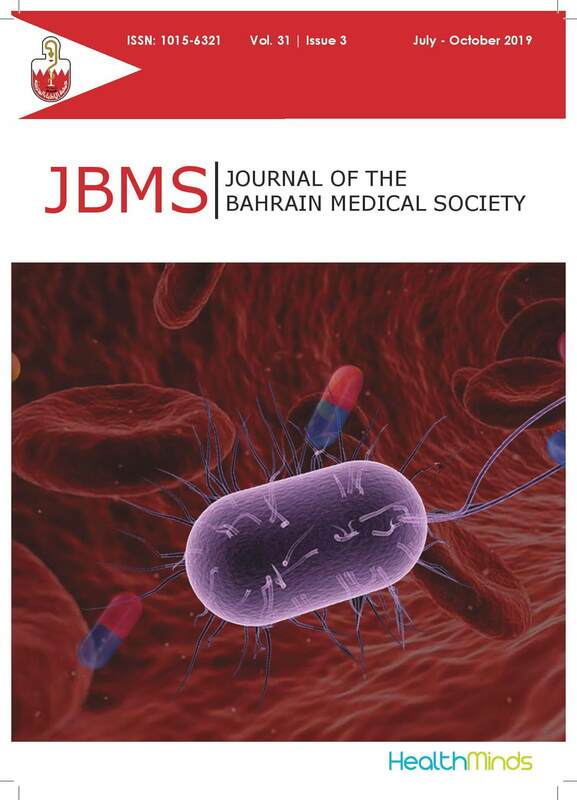 Welcome to the Journal of Bahrain Medical Society (JBMS), established in 1989, and is the official journal of Bahrain Medical Society (BMS). The journal is sponsored by the Kanoo Foundation, Bahrain and is published by HealthMinds Consulting Pvt. Ltd, India. JBMS is an international, open access and peer-reviewed medical journal. The scope of the journal is to publish research that interests the health specialties, both in the academic and clinical practice. Our target readers include all medical and health professionals in the health cluster, such as medicine, dentistry, nursing, applied medical sciences, clinical pharmacology, and public health among many others. The journal is published in print and online. We publish a wide range of articles, including original research, case reports, and preliminary studies. We do this to complement one of the missions of BMS which is providing quality healthcare through quality medical education. We have overcome the challenges that we faced in the past years with our current committed and dedicated team of Chief Editor, Deputy Chief Editor, and the Editorial and Advisory Boards. Further, JBMS has added some exciting new features. We now offer our authors and readers the opportunity to access articles, in our website, before they are published in print. Authors and reviewers can earn CME credits through the National Health Regulatory Authority (NHRA). On behalf of the entire JBMS team, I thank you for visiting our online home. We hope you will find JBMS to be a helpful resource for taking your research forward. Please do not hesitate to contact us with any queries, concerns, or comments you may have. It gives me great pleasure to welcome you to this issue of JBMS. This issue presents interesting five original research and unique two case reports. Although the articles in this issue are primarily from the Kingdom of Bahrain, a handful of them are from different parts of the world. We are proud to have achieved an average review time of 82 days particularly for this issue. We are forever thankful for all our collaborators and players without whom this would not have been possible: the authors, reviewers, board members, the editorial office and last but not least we are forever grateful for our partnership with health minds and Kanoo foundation. We hope that JBMS will continue to become a fundamental platform for researchers to share findings with the international community. Further, we hope that we will be indexed in Pub med in the near future. We are now welcoming submissions for future issues of the journal.